As higher education budgets tighten and environmental consciousness grows, university administrators are turning to the mechanical engineers of FSB now more than ever in search of solutions for reducing energy usage and lowering monthly utility costs. The historic buildings and sprawling campuses that characterize many higher learning institutions require huge amounts of energy, but appropriately adjusting or upgrading heating, cooling and lighting systems can quickly lead to six-figure annual savings. The key to maximizing savings, FSB President Gary James said, is a highly individualized approach beginning with an interview with the client and a thorough building walk-through, followed by careful analysis to guide a decision-making process. To predict potential energy savings, FSB’s team of mechanical engineers reviews utility bills, lighting and print-outs from chillers and pumps, which offer insight into the amount of energy each piece of equipment regularly uses. Based on their assessment, FSB can accurately model the buildings’ existing systems and predict how adjustments might affect energy usage. For example, Brian Sauer, FSB’s director of mechanical engineering, said the firm was hired to replace the WWII-era boilers and 30-year old chillers in Oklahoma State University’s old central plant, which provides steam and chilled water for buildings throughout campus. FSB’s engineers began the project by creating a campus utilities master plan to understand how the buildings were performing and determine where on campus the plant should be located. They also factored in buildings slated for construction to predict heating and cooling needs as far as 20 years into the future. 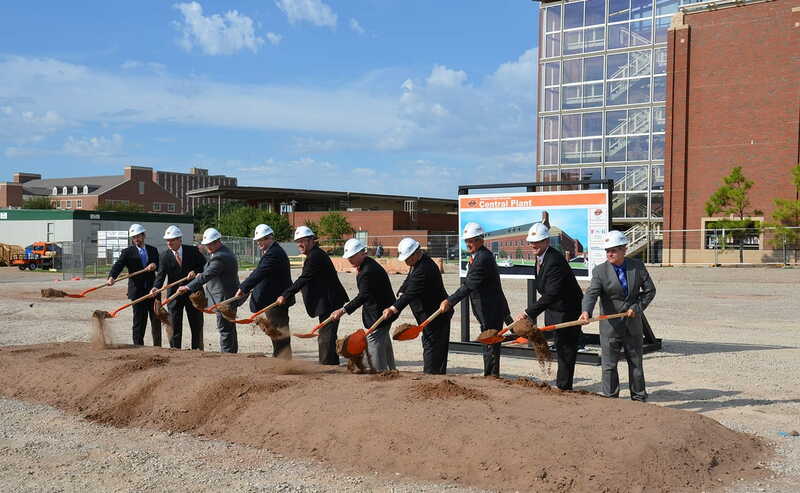 Oklahoma State broke ground on its new plant in September 2015, and Oklahoma State Director of Energy Services James Rosner said when the project is complete and the plant is powered on the university will begin to save $350,000 annually in utility expenses alone, and about $120,000 in reduced annual maintenance expenses as the new equipment will require fewer repairs. In addition to the initial efficiencies, Rosner said the central plant designed with the future in mind — to accommodate the campus’ anticipated growth. The building includes space where the university can add additional heating and cooling equipment without requiring a renovation. Administrators at another Oklahoma university, Oklahoma Christian University in Edmond, reached out to FSB in 2006 with a similar need — to keep buildings consistently cooler, conserve energy and reduce the campus’ monthly utility expenses. Oklahoma Christian didn’t have a central plant at the time. After studying the school’s energy usage, FSB found that consolidating the campus’ heating and cooling equipment to one location would reduce the utility bills related to heating and cooling by about 40 percent, or about $500,000 per year. While renovating or reconfiguring heating and cooling systems is one strategy that, when appropriately applied, can bring major utilities and maintenance savings, this is one of many tools FSB’s mechanical engineers might recommend to a client. Others include ground source heat pumps, LED lighting, solar panels and automated controls. The team has worked to improve efficiency in buildings for many industries, as well as in many parts of the world. Sauer said each project begins with understanding factors like size of maintenance staff, age and composition of a building, and usage. For example, on a college campus a lab has very different needs than an administrative office. Even the geography and climate where the building is located is a factor. The art, Sauer said, lies in understanding the client’s unique needs and determining which technology is the best fit. To learn more about cost savings and energy design for your next project contact Laure Majors at busdev@fsb-ae.com or call her direct at 405.840.2931.